Nicola Sturgeon will lead thousands of marchers at Scotland’s largest lesbian, gay, bisexual, transgender and intersex (LGBTI) pride event this weekend. 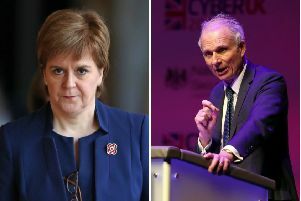 The First Minister is not expected to meet US President Donald Trump on his visit to Scotland this weekend, and will instead lead the Pride Glasgow march through the city on Saturday. Ms Sturgeon, who has been a vocal critic of Mr Trump, has been named honorary grand marshal for the event in recognition of her long-standing support for LGBTI equality. She said: “I’m proud that Scotland is considered to be one of the most progressive countries in Europe regarding LGBTI equality and Pride Glasgow is a fantastic event that brings communities together and celebrates all that LGBTI people bring to Scottish life. “As a society we must champion equality and fairness at all times and defend the progress that has been made. Alastair Smith, chief executive of Pride Glasgow, said: “We’re delighted to name First Minister Nicola Sturgeon the first honorary grand marshal of Pride Glasgow in recognition of her longstanding support of LGBTI equality. Suki Wan, chair of the Scottish Youth Parliament, added: “It’s an honour to have been asked to accompany the First Minister to open this year’s Pride Glasgow. “Everyone in Scotland should feel safe and happy; safe to be who they are, and to love who they love. We know that isn’t the case for everyone, despite enormous steps which have been taken in recent years. Ms Sturgeon will become the first serving prime minister or first minister in the UK to march at a pride event. More than 8,000 people are expected to take part in the march from Clyde Place to Kelvingrove Park through the city centre, with around 50,000 spectators expected.